I have a difficult time getting my husband to eat zucchini. He doesn’t like the flavor of zucchini, so he rarely enjoys one of my zucchini dishes unless I’ve sufficiently masked the zucchini flavor. Normally, I would bake these crisps in the oven. It’s healthier, less work, etc. But the issue with the oven is that you really need to eat the baked crisps right away. 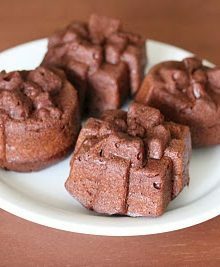 So they aren’t ideal to make for a party or to make ahead of time. Also when panko is baked in the oven, it usually remains fairly pale so it doesn’t look as appetizing. So for these, I decided to pan-fry them. 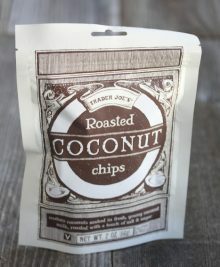 It’s not as healthy as a baked version, but they stay crispy a lot longer. And you only need a little oil to pan fry them. The panko crust also comes out a beautiful golden brown when it’s cooked in the pan. You can eat these as they are or serve them with a dipping sauce. 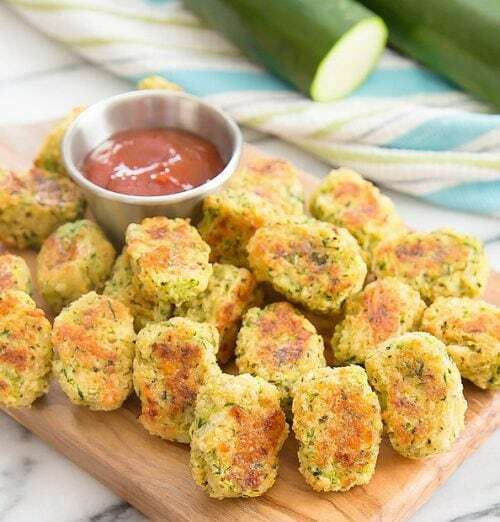 For a baked parmesan zucchini recipe, check out my Parmesan Zucchini Tots! 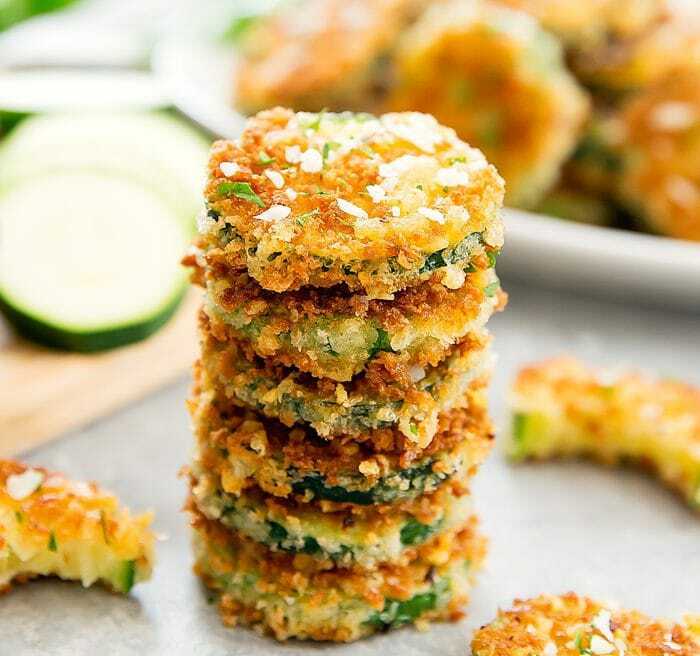 Zucchini slices are coated in parmesan cheese and panko breadcrumbs and cooked until crispy. In a medium bowl, mix together panko and cheese. Set aside. 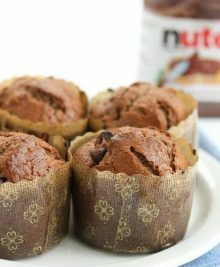 Set aside flour in a small bowl. Set aside egg in a separate small bowl. 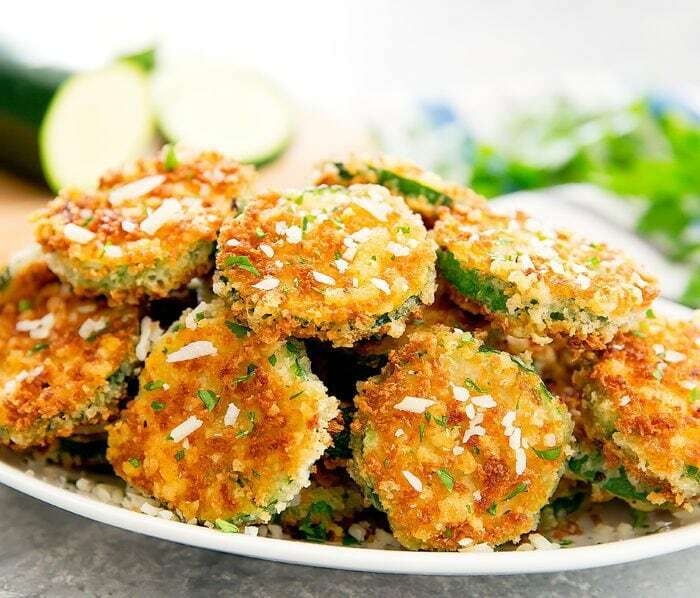 Take a slice of zucchini and lightly coat in flour. Tap zucchini against the side of the bowl to get off any excess flour. 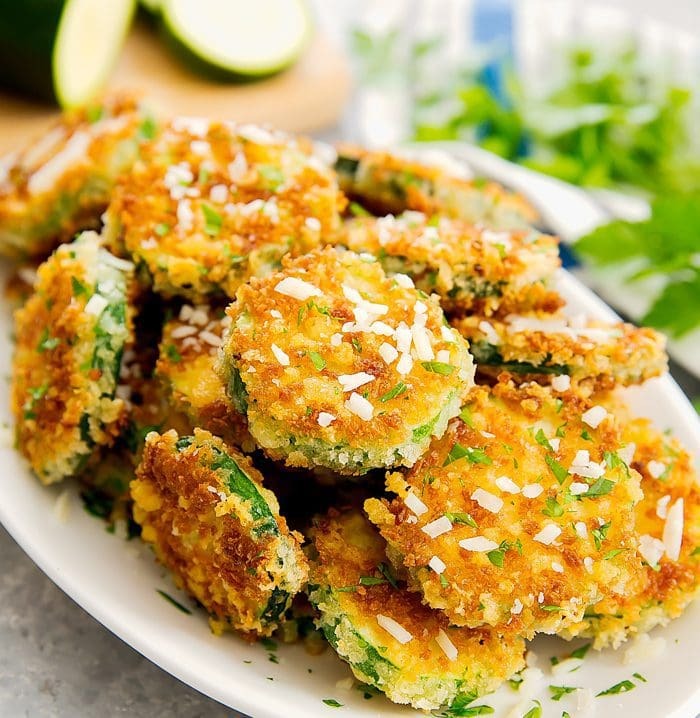 Coat zucchini slice in egg. Shake off any excess egg drippings. 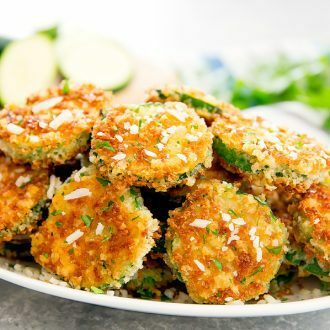 (This is important because you do not want the excess egg drippings to get into the panko mixture as it will cause the panko to not stick to the zucchini.) Roll zucchini slice into breadcrumb mixture, pressing slightly to get the breadcrumbs to stick to the zucchini. Repeat with remaining zucchini slices. In a small pan or skillet, add 1/4 cup oil. This should be enough to cover the surface of the pan in a very thin coat of oil. Bring oil to medium heat. 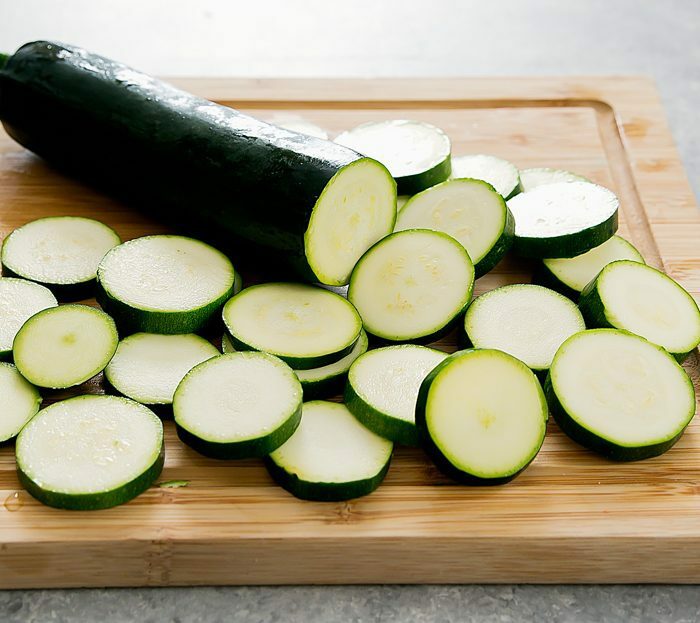 Working in small batches, carefully place about 5 slices of zucchini into the hot oil. Cook until bottom turns a golden brown. Flip over and cook other side until crispy and golden brown. Remove from oil when done and place onto a paper towel-lined plate to soak up some of the excess oil. Repeat with remaining zucchini slices. You may need to add a little more oil to your pan to finish cooking all the zucchini slices. 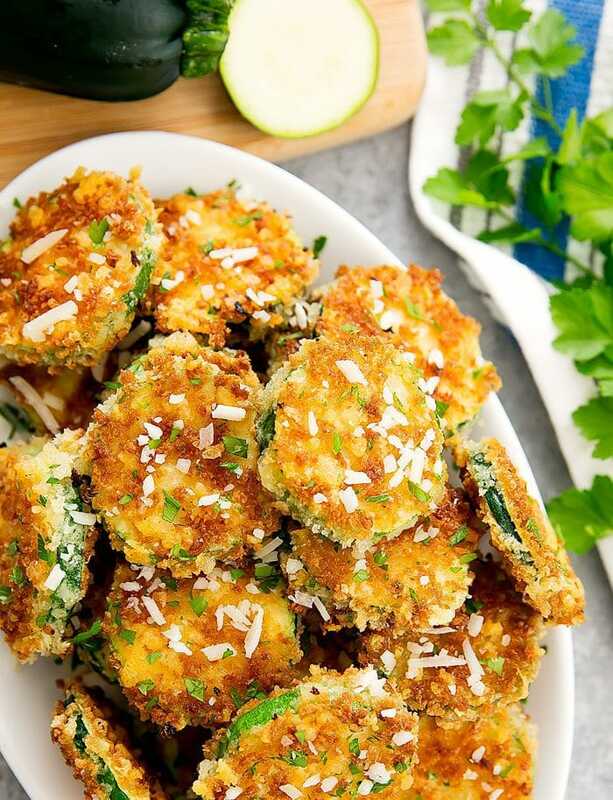 Sprinkle zucchini slices with parsley and more parmesan cheese if desired. Serve while warm. You can add a dipping sauce as well. Nutrition estimate includes 1/4 of olive oil. Love this dish. It looks very healthy too! Thank you for sharing. Made it.. tasty but I’ll add a pinch of salt next time. And I’ll to the flour step all at once to same time cuz this can be very time consuming. Tried egg replacer on last few slices and it still tasted good.